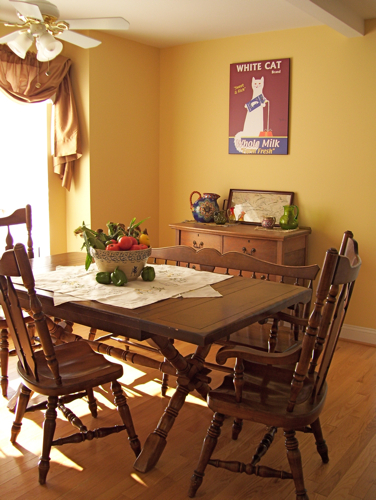 I wanted a quick and simple update to my eat-in kitchen and family room and I was itching to bring in some fabric. 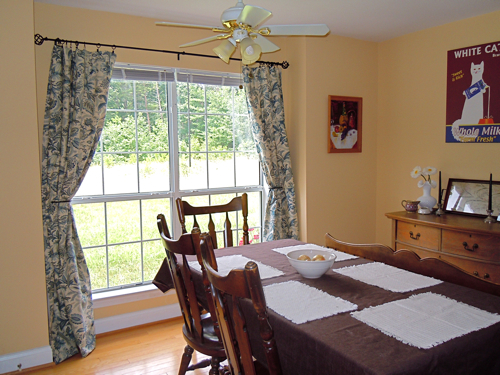 There aren’t many options for trimming out your kitchen in fabric, and I felt that I could use a really beautiful fabric as the showpiece on the windows. I debated and pined and scouted and waited for sales, and finally decided on a Better Homes and Gardens fabric. I waited until there was a 50% off sale at JoAnn’s, and I had a 10% off everything coupon, so my total for this project (four curtain panels) ended up being about $115. Not bad for super thermal, super beautiful curtains. I hoisted the curtains up for maximum light for the shot. But you can see there’s not much to them, just a gold silk-like fabric. I believe they were by Chris Madden at JCPenney’s. I needed to keep a thermal barrier at this window because it gets full south-western exposure. 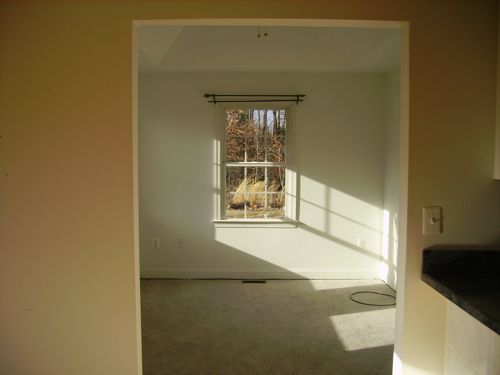 In the summer, it can get very hot here in Virginia, and I want to keep my house as naturally cool as possible (and keep those cooling bills low). 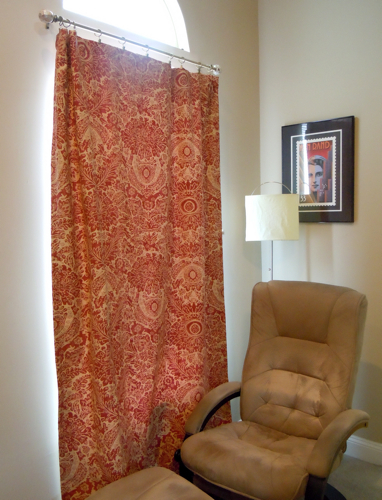 I had no other plans for these curtains, and so decided to reuse them, and just sew directly over top of them. 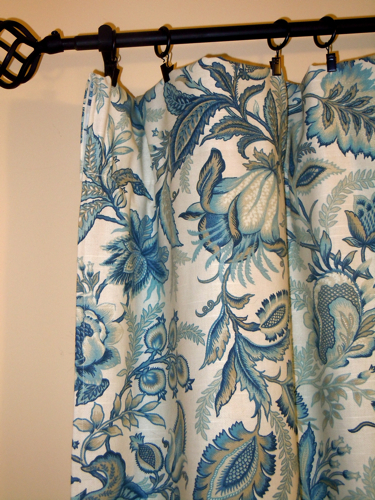 The fabric I chose is called “Wicklow Indigo” by Better Homes and Gardens. I love this fabric. I had already purchased the rings, and decided not to worry about keeping a fancy top. Instead, just a simple single pocket (just in case). 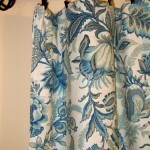 I also wanted to sew these together for added strength, durability (we open and close the curtains daily), and looks. First I laid the fabric out, and cut the appropriate amounts. 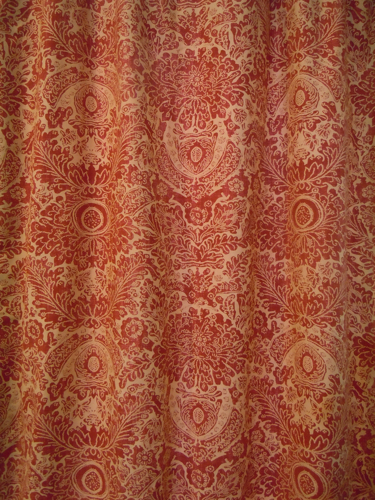 Ideally, you want about 2.75 yards for 84″ curtain panels. At this point, Peanut wanted to help. 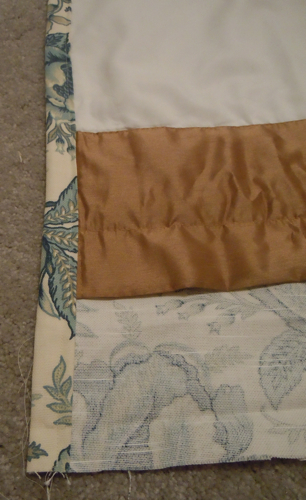 After cutting and lining up the fabric, I pinned the edges over. Side of fabric pinned down to old curtain panel. Next I ironed the folded and pinned edge for a nice crease. 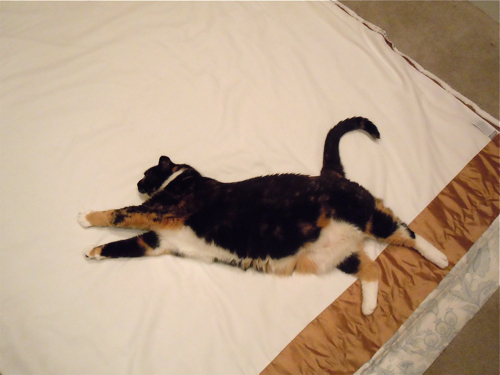 This helps the fabric lay flat (and stay in line) while sewing. 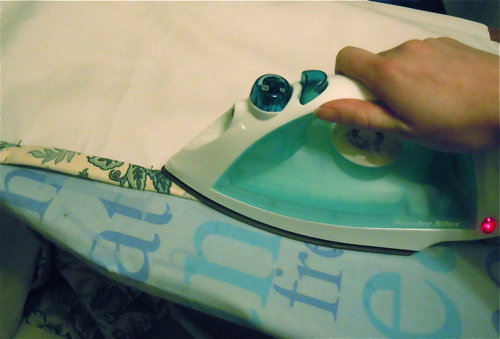 Sew a straight line with you sewing machine! 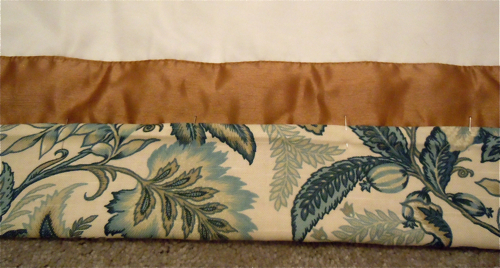 I sewed right over top the old pockets because I did not feel up to taking the whole curtain panel apart first. Getting close! I then folded and pinned the top and bottom. 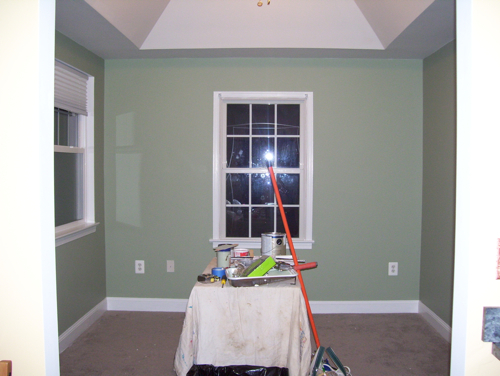 I used the original curtain as the guide to keep a straight, even line. 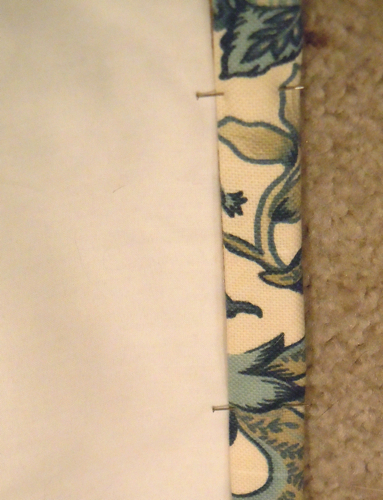 Bottom edge of fabric pinned. At this point, you can iron again, and then sew. And voila! New, thermal curtains! New thermal curtains in the kitchen. I then did the exact same treatment on the curtain in the living room. 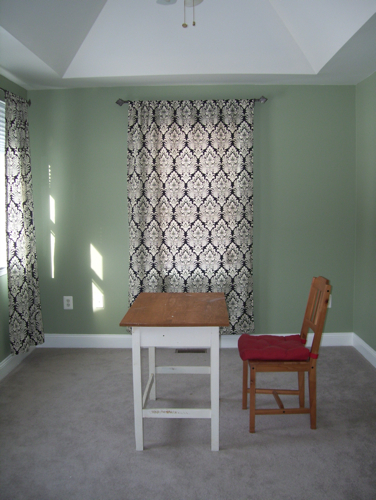 No before shot, but they were exactly the same as the kitchen drapes except they were a ruby red color. 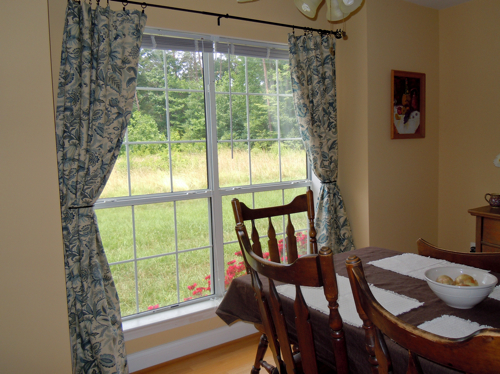 New family room thermal curtain.